After a few less successful birthday cakes, a few of my friends cruelly wait with baited breath to see what I'll "create" for the next birthday. My little boy loves Dinosaurs or anything that goes "raaa!!" 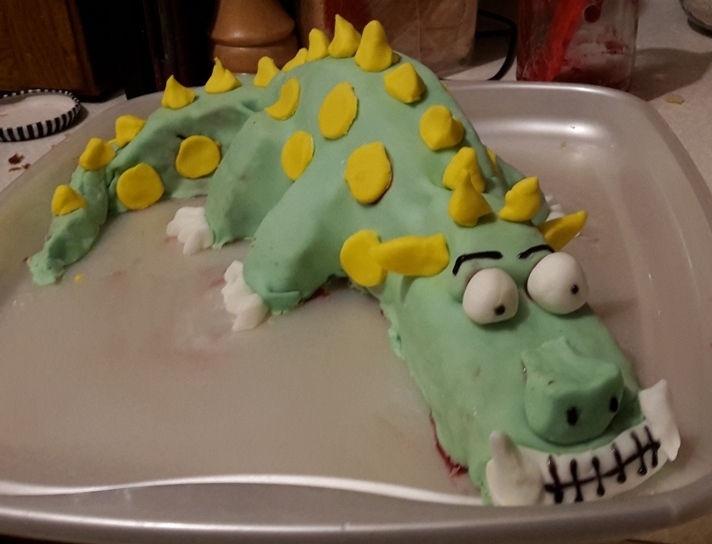 So I made a dinosaur cake for him. I'm certainly not going to give up my day job (if I had one) but he and the girls loved it and it has a certain homemade charm to it. He did try and rip his eyes off when he got near to it though! I've got to make another cake for my eldest who turns five at the weekend - any ideas? She keeps changing her mind on what she wants (last request was a cake shaped like a strawberry)! Awesome effort with the cake! You did really well. This is great - you don't need to change a thing. I did a bumble bee for Grace's 5th. A circular sponge (2 layers) cut down the middle and turned in on itself to make a hill so to speak. Then covered with yellow icing and a black stipe, added piping antennars, eyes and wings...she loved it. Ladybirds are nice to do too. The dinosaur cake is fab... dont let the peppa pig cake hold you back. As it is a forest party how about a fairy cake or a butterfly? Heck I cant cook cakes, I can make bread but a cake is well beyond my skills!!! Oh, that cake is precious! Great Job!! that is SO cute! you did such a good job! how about a heart cakes since valentine's day is coming? I think your dinosaur cake is fabulous, and I'm sure your little boy will love it. Great attempt, better than I could go.